For many years, people in the UK have been shopping for rugs at Nazmiyal Antique Rugs in NYC. People throughout United Kingdom of Great Britain and Northern Ireland have always had a passion for good rugs and carpets. While there are some antique rugs dealers in London and throughout England, there are very few that would have such a massive collection of good antique carpets that we at Nazmiyal have. That is the reason why interior decorators and buyer of antique rugs in the UK some directly to us – that worldwide source for antique rugs! The United Kingdom of Great Britain and Northern Ireland, more commonly known as either the United Kingdom, Britain, or the UK, for short, is a sovereign country which is located to the north west of mainland Europe. The UK includes the island of Great Britain and also the north-eastern region of Ireland, as well as a few smaller islands. Of the areas of the United Kingdom, Northern Ireland is the only one that has a common land border with another sovereign state, which is the Republic of Ireland. Aside from this border, the UK is fully surrounded by the Atlantic Ocean, with the English Channel to its south, the Celtic Sea to the south-west, and the North Sea to the east which pegs the UK as the nation with the 12th longest coastline in the entire world! Between Ireland and Great Britain lies the Irish Sea. The UK is the 78th largest country in the world, with an area of 242,500 square kilometers and is the 22nd-most populated country, with a population of nearly 66 million in 2017. The United Kingdom is both a constitutional monarchy and a unitary parliamentary democracy. The UK’s current monarch is Queen Elizabeth II, who has reigned since 1952, which makes her the current longest-serving head of a country. The UK’s largest city is London, which is also its capital. London is a financial center and global city, with a population of 10.3 million! Some other major cities in the UK include Liverpool, Leeds, Glasgow, Birmingham, Manchester, and Newcastle. England, Scotland, Northern Ireland, and Wales make up the four countries that the UK is comprised of. The capital cities of each are London, Edinburgh, Belfast, and Cardiff. Besides England, each of these countries has their own governments, each with their own degrees of power. The islands in close proximity to the UK including the Isle of Man, Bailiwick of Jersey, and Bailiwick of Guernsey are not a part of the United Kingdom but are Crown dependencies which the British Government is responsible for representing and defending. The United Kingdom of Great Britain and Ireland came about as the result of the union of Scotland and England in 1707, the annexation of Wales by England during medieval times, and the union of the Kingdom of Ireland with Great Britain in 1801. Following the secession of five-sixths of Ireland from the UK back in 1922, the current makeup of the UK resulted. During the height of the British Empire’s power, back in the 1920’s, nearly a quarter of the world’s landmass was a part of it, though now there are only fourteen British Overseas Territories. The British Empire was the largest empire ever and its influence can be seen in the culture, language, and political systems of numerous former colonies. By nominal GDP, the UK is the world’s fifth biggest economy, and the ninth largest when looking at purchasing power parity. The UK features a significant Human Development rating, which ranks it 14th throughout the world, and is considered a high-income economy. Between the 19th and early 20th centuries, it was the world’s leading power and was the first country to become industrialized. To this day, the United Kingdom has a powerful presence, with significant cultural, economic, scientific, political, and military influence across the globe. It has the sixth highest military expenditure in the world and is considered a nuclear weapons state. Since the United Nations Security Councils inception back in 1946, the United Kingdom has been a permanent fixture. It was a top member of the European Economic Community (EEC) before being a leading state in the European Union (EU) since back in 1973. A referendum in 2016 resulted in a 51.9% majority of the United Kingdom’s voters voting in favor of leaving the EU, and, at the time of this writing, the UK’s exit was being negotiated. The UK is also a prominent member of the Council of Europe, the G7, the G20, the Commonwealth of Nations, the Organization for Economic Co-operation and Development (OECD), NATO, the World Trade Organization (WTO), and Interpol. For those living in the anywhere in the UK / United Kingdom of Great Britain and Northern Ireland Nazmiyal in NYC is happy to help find the best antique rugs for your home. 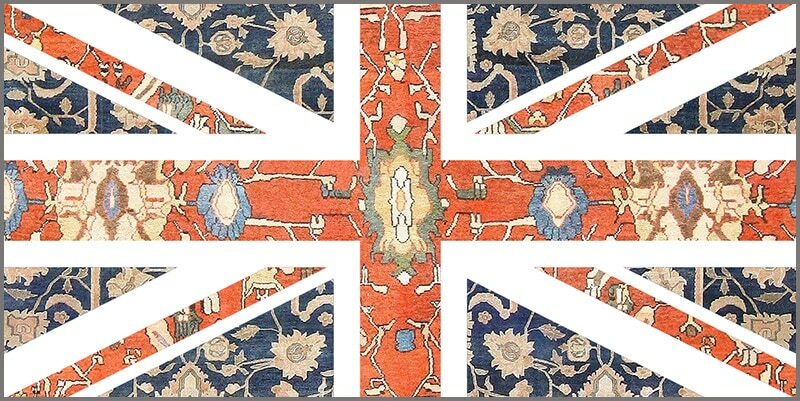 As we previously noted, we have clients and antique rug connoisseurs from all over the UK.